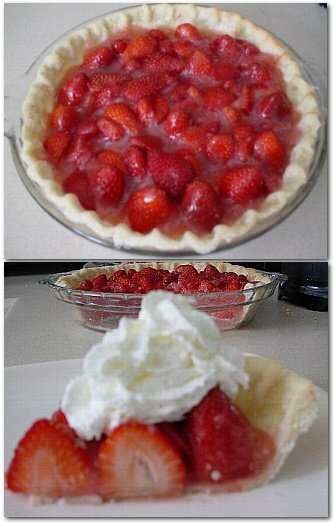 This is such an easy recipe… I make this whenever strawberries are in season. Soooo yummy! Heat oven to 450°F. Make pie crust as directed on box for One-Crust Baked Shell using 9-inch glass pie pan. Bake 9 to 11 minutes or until light golden brown. Cool completely… about 30 minutes. Wash and hull strawberries; drain well on paper towels. In 2-quart saucepan, mix sugar and cornstarch. Stir in water. Cook over medium-high heat, stirring constantly until mixture boils. Cook 1 minute, stirring constantly, until glaze mixture is thickened and clear. Remove from heat. Stir in almond extract. Cool 10 minutes. In large bowl, gently mix strawberries and glaze mixture. Spoon berry mixture evenly into cooled baked shell. Spoon whipped topping evenly over berries. Refrigerate at least 2 hours or until set before serving. If desired, garnish with fresh strawberry halves. Store in refrigerator.